US Coast Guard personnel and civilian contractors deploy a containment boom around a civilian-owned YP craft found to be leaking fuel in the Patuxent River. NAS Patuxent River Port Operations Division successfully handed off containment and cleanup efforts to the US Coast Guard on Aug. 30 after two days of first responder containment. US Navy photo. A civilian watercraft in the Patuxent River was leaking fuel Aug. 28, 2018, and staff from Naval Air Station Patuxent River saw the leak and began working to contain it, then successfully turned over containment and cleanup efforts for the partially submerged civilian watercraft to the US Coast Guard two days later. Members of the NAS Patuxent River’s Port Operations Division noticed a sheen on the water close to the civilian craft during routine monitoring of the vessel. Staff members immediately responded with two boats and deployed a 1,000-foot containment boom. Personnel from US Coast Guard Station St.
Inigoes were then notified and dispatched for response and investigation. By 10:35 a.m. Aug. 28, NAS Patuxent River’s Port Operations had contained the 100-by-300-foot fuel sheen. 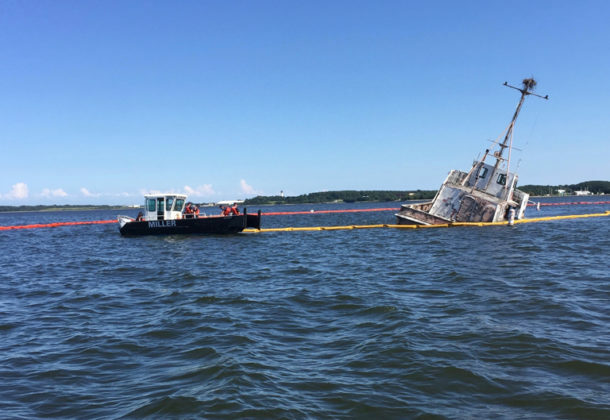 The boat is a privately owned craft and was not within the jurisdictional waters of the Navy, but NAS Patuxent River Port Operations reacted quickly because they were closest first responders who could prevent environmental impact to the river. On the afternoon of Aug. 30, the Coast Guard used absorbent pads to collect the potentially harmful oil or fuel that was inside the Navy’s containment boom before placing their own boom, allowing the Coast Guard and contacted cleanup personnel to efforts of containment and cleanup. To learn more about NAS Patuxent River visit it online or the organization’s Facebook page.